Boys Varsity Water Polo · Nov 1 Boys Varsity Water Polo falls to Segerstrom 14 – 6. 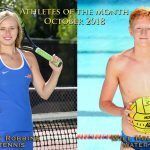 Congratulations to Emily Robbins and Will Hollister for being chosen Athletes of the Month for October! Boys Varsity Water Polo · Oct 24 Boys Varsity Water Polo falls to Oaks Christian 10 – 5. Boys Varsity Water Polo · Oct 19 Boys Varsity Water Polo beats Thousand Oaks 11 – 10. Boys Varsity Water Polo · Oct 17 Boys Varsity Water Polo beats Calabasas 13 – 1. Boys Varsity Water Polo · Oct 12 Boys Varsity Water Polo falls to Newbury Park 13 – 6. Boys Varsity Water Polo · Oct 6 Boys Varsity Water Polo beats Calabasas 22 – 10. Boys Varsity Water Polo · Oct 5 Boys Varsity Water Polo falls to Oaks Christian 9 – 3. Boys Varsity Water Polo · Oct 3 Boys Varsity Water Polo beats Thousand Oaks 13 – 9. Boys Varsity Water Polo · Oct 1 Boys Varsity Water Polo beats Martin Luther King 10 – 1.